2010 Bowman Chrome Baseball is proof positive that prospector's paradise does exist. Part II in this year's Bowman trilogy delivers one of the most intriguing prospect auto checklists in the product's storied history. If you have even the slightest interest in prospect cards, I highly recommend ripping a box of 2010 Bowman Chrome. It's hard to go wrong paying $80 for a product that excels on so many levels. 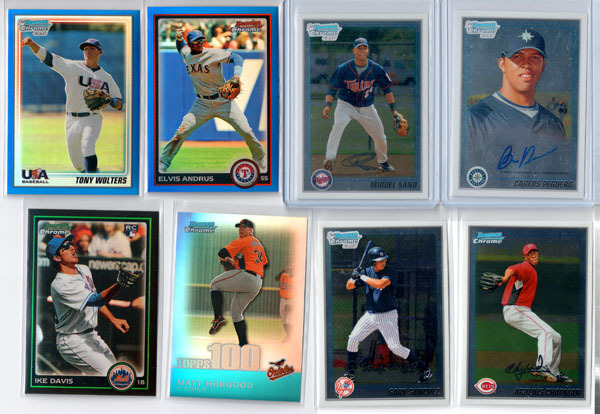 As far as I am concerned, 2010 is the best Bowman Chrome has ever looked. The card design is sharp, crisp and translates seamlessly to chrome. The only area in which Bowman Chrome's card design fails is found in the set's USA Baseball autographs. The 18 and Under autographs feature unappealing sticker drops, while the USA Baseball Buyback autographs look like they were signed by some random dude with a pen and poorly conceived scam. Miguel Sano, Aroldis Chapman, Gary Sanchez, Carlos Peguero, Francisco Peguero, Wilin Rosario, Adeinis Hechavarria, Eury Perez, Arodys Vizcaino and Simon Castro highlight what is without a doubt the greatest Latin American prospect auto checklist in Chrome's storied history. The USA Baseball sector of the CL leaves you scratching your head. I have never and will never be a fan of USA Baseball cards for the simple reason that they haven't been drafted yet. Now that Topps is the only licensed baseball card manufacturer, I would like to see them save their shots instead of rushing players to the market to sell a product. You can't go wrong paying $80 for a product that delivers on so many levels. The intriguing prospect and rookie checklist combined with the sets autos and refractors add up to an awesome return on investment. The poorly conceived USA Baseball Autographs are the only real issue I have with the product, but they are to be considered gravy on the 2010 Bowman Chrome sandwich. There are few products that can match the pure excitement of opening a box of Bowman Chrome Baseball. The inclusion of Miguel Sano made the prospect checklist one of my all-time favorites. The only real complaint I have is that I wish Bowman Chrome would deliver 2 hits instead of just 1. This would elminate the "boom or bust" fears that accompany ripping any single hit box. 2010 Bowman Chrome Baseball Box Factory Sealed Hobby Stanton Rookie? 2000 Bowman Chrome Baseball Hobby Pack Fresh from Box! “2010 Bowman Chrome Refractor Error.” Are these rare? Corrected? Uncorrected? Thank you to anyone that helps. Are aroldis champan and miguel sano auto graph or auto pen? @Nick Gupta: they are facsimile autographs, the only real autograph pictured is the Carlos Peguero.